Stamps Tell Stories... This collection includes all of the stamps that were issued during the course of the year 2009. 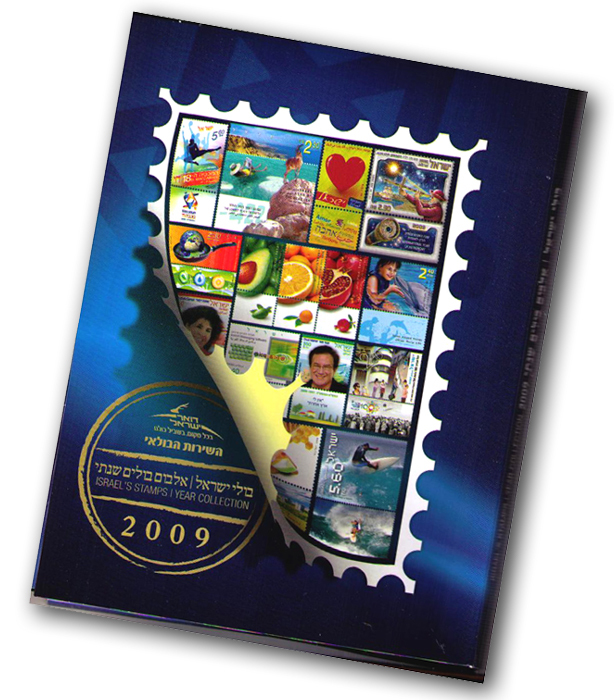 An explanatory leaflet is also included describing the stamps in Hebrew and English. Packed in a Gift Stamp Album. The Virtual Communication stamp series presents three technological breakthroughs that were developed in Israel and have become household tools throughout the worId. These products embody the immense capabilities of Israel’s elite technology industry and the innovativeness of Israel’s software developers. Voice over Internet Protocol. The internet was originally designed to transfer computer data thus a special application that would allow the transfer of telephone calls via internet had to be developed. USB Flash Drive. An innovative device that could be connected to a computer quickly and easily. It was small, reliable and enabled unlimited expansion of the scope of memory. The connection between human beings and the animal kingdom is imprinted in the collective unconscious and molds our emotional world. The new field of Animal Assisted Therapy utilizes this connection to further human wellbeing. Eretz Israel was said to be a Land Flowing with Milk and Honey. The stamp series depicts the sweet delicacy’s journey from the flower in the field to people’s tables.The stamp tabs depid important milestones in the raising of honeybees in Israel. Archeological excavations inTel Rehov in the Beth-Shean Valley have recently unearthed beehives used in the ancient beekeeping industry dating to the period of the Israelite monarchy in the 10th-9th centuries BCE. The hives, made of elongated mud cylinders, are the only ones discovered to date in archeological excavations of The Ancient Near East. Remains from ancient cultures are abundant along the coastline of Eretz Israel. These remains are material evidence of the activity of the diverse civilizations which inhabited these shores over thousands of years. This joint issue marks the beginning of the Jewish theater in lasi Romania in 1876 and the lifework of the theater's founder, Abraham Goldfaden: a poet and father of the Jewish theater. His troupe gave rise to many other theater troupes which frequently made use of his repertoire, including plays such as: The Witch, The Two Kuni-Lemls and Shmendrik (The Comical Wedding). Goldfaden travelled throughout Europe, Russia, the Ukraine and America with his troupe. The original theater he created filled the community’s needs and impacted the artistic development of the Jewish and Hebrew theaters as they came into being. Many of his plays continue to be produced in Israel and in Jewish theaters throughout the world."